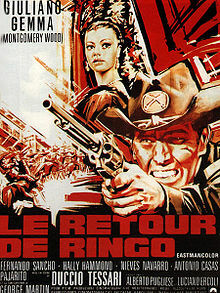 With my viewing this morning of THE RETURN OF RINGO, I complete the list of essential top twenty films as voted on by fans of the Spaghetti Western Database. I finally found an English dubbed version(Youtube has an Italian and an Italian with German subtitles). In the only official sequel to A PISTOL FOR RINGO. As was the custom of that time in Italian cinema, other films piggybacked off successful franchises hoping to rake in extra bucks. Giuliano Gemma(billed again as Montgomery Wood) reprises his role as the hero Ringo, this time with a name to go with the nickname, Captain Montgomery Brown. Many of the other actors from the original appeared again, though some played different roles. Fernando Sancho and George Martin play the Fuentes brothers, Estaban and Paco respectively. Lorella De Luca(billed as Hallie Hammond) this time around plays Ringo’s wife, Helen Brown. Captain Montgomery Brown is returning home from the Civil War and stops off at an old friend’s saloon at a small stop near his New Mexico home. There he starts to learn of some changes.. He kills four Mexican bandits that brace him and learns the Fuentes brothers control the area, claiming it for Mexico, and have taken up residence in his own home. Ringo dyes his hair and goes into town undercover as a Mexican peasant. He has to find out what happened to his wife. He knows the lay of the land now, but a sign on the saloon reinforces it; No gringos, endios, or bums. 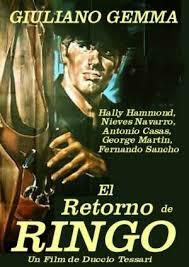 THE RETURN OF RINGO is a bit different from most spaghetti westerns. A mixture of romance and action in almost equal doses. Though it’s been many years since I read it, the film has a sample of the Odyssey to it, a man returning from war to find everything turned upside down, his wife about to marry Paco Fuentes. He needs to find out why. And he does in short order when he sees a small blond girl in the company of his wife, under the watchful eye of a number of guards. The film plays out against a town frightened to death of the bandits. During the war, gold had been discovered in the area and the Fuentes brothers had come out of Mexico to take control. Most of the town’s young men were off to fight the war and no one opposed them. As they returned they were picked off by the bandits. The sheriff is an old man who drinks, doesn’t wear a gun(“it’s safer. After all, I’m an American, a member of an inferior race”). Ringo takes a job with Morning Glory((Manuel Muniz), the florist and as such gets into his old home preparing for the coming wedding. To satisfy the Catholic Church, the Fuentes brothers have arranged to have a casket brought in bearing the body of the late Montgomery Brown, the hero that fell in the war, and accorded him a commiserate funeral with all the trappings. Ringo spies Estaban paying off the fake U.S. soldier that drove the wagon. Access to his home affords him a chance to set up some things. He’s caught taking an old music box he owned a long time and, in the spirit of the festivites, Paco doesn’t cut off is hand as customary, but drives a big knife through the right, his gun hand. Ringo appears as himself, in full uniform, to disrupt the wedding and the battle is on. 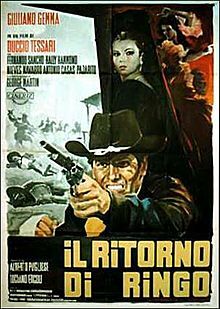 The final assault on his ranch to rescue his daughter, who he learns is named Elizabeth after his mother, is well orchestrated with the familiar acrobatics, the peculiar weapons central to many spaghetti westerns, and the heroics of our hero. 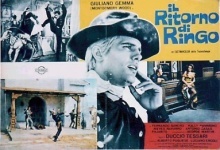 The film is directed again by Dussio Tessari and the music is by the incomparable Ennio Moricone. Giuliano Gemma. Montgomery Wood. Guess that makes sense. 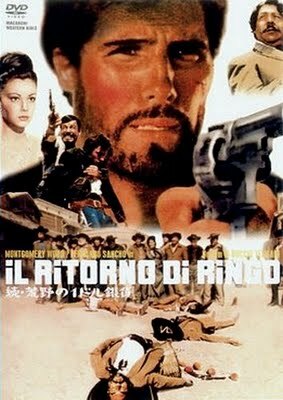 A lot of Italian actors in these spaghetti westerns used American sounding names, one presumes for th English speaking markets. I have seen only one or two of these. I have come to the conclusion that my attention is now too fractured to watch a movie on TV. I always have a book and my Ipad with me and end up only half watching it. Yes, my brain is now rewired.